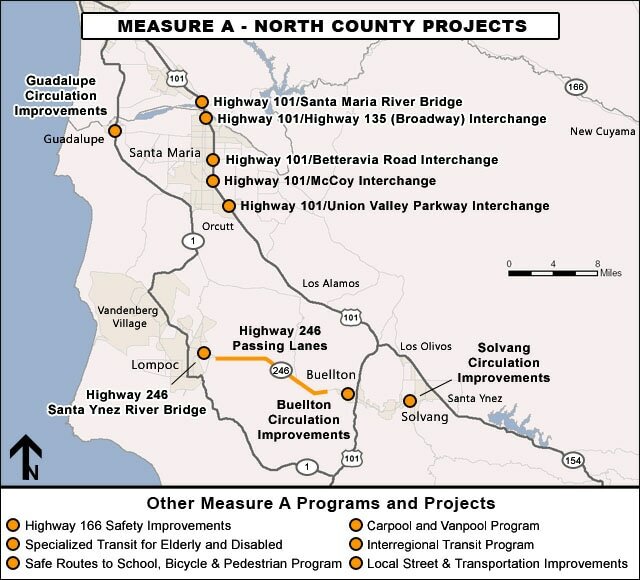 The $455 million in funding for projects north of the Santa Ynez mountains includes the cities of Buellton, Guadalupe, Lompoc, Santa Maria, Solvang and all unincorporated areas including Orcutt, Vandenberg Village, Los Alamos, Los Olivos, Santa Ynez, and New Cuyama. Nearly 70% will go to local governments and will be used to fund projects that are a priority in each community including road maintenance, repair and improvements. Each city council and the board of supervisors will select projects with public input on an annual basis. For more information about each project, please click on the project name in the map below.